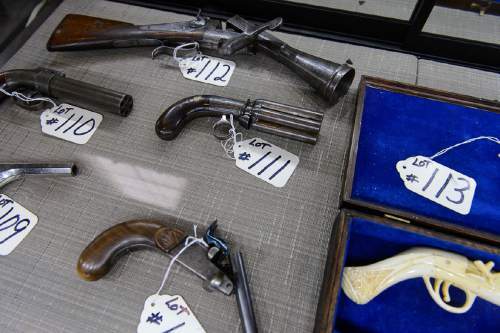 Trent Nelson | The Salt Lake Tribune Vintage firearms, set to be auctioned off at Erkelens & Olson, which is celebrating its 40th year in the auction business. Salt Lake City, Friday April 22, 2016. 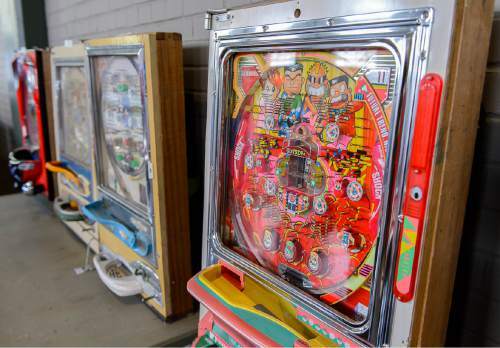 Trent Nelson | The Salt Lake Tribune Pachinkco pinball machines set to be auctioned off at Erkelens & Olson, which is celebrating its 40th year in the auction business. Salt Lake City, Friday April 22, 2016. 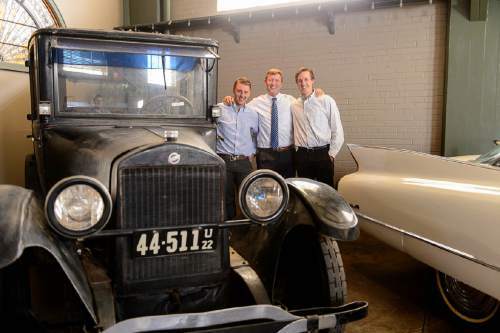 Trent Nelson | The Salt Lake Tribune Auctioneer Rob Olson, right, and his sons Robert, left, and David pose for a photo at Erkelens & Olson, which is celebrating its 40th year in the auction business. Salt Lake City, Friday April 22, 2016. In the photo is a 1922 Studebaker and a 1960 Cadillac. 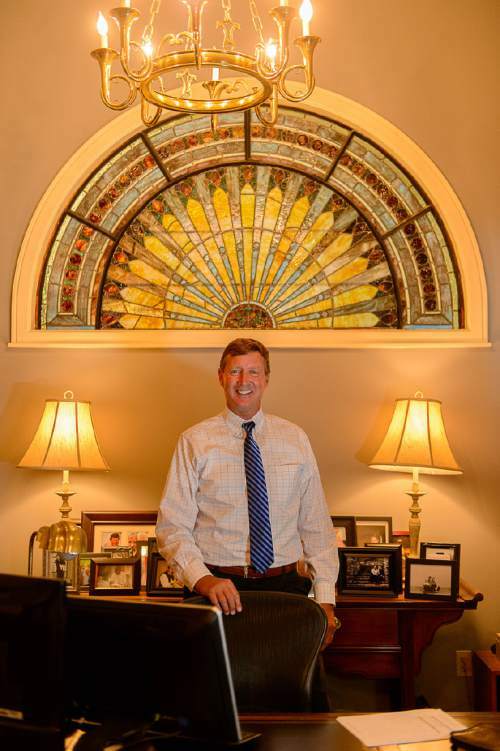 Trent Nelson | The Salt Lake Tribune Auctioneer Rob Olson poses for a photo in his office at Erkelens & Olson, which is celebrating its 40th year in the auction business. Salt Lake City, Friday April 22, 2016. 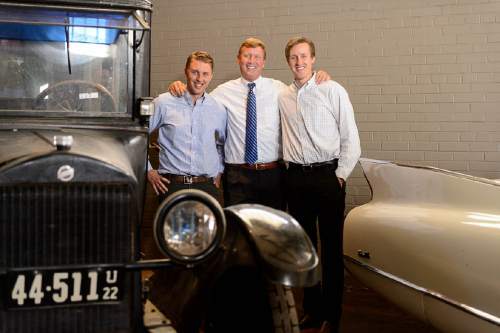 Trent Nelson | The Salt Lake Tribune Auctioneer Rob Olson, right, and his sons Robert, left, and David pose for a photo at Erkelens & Olson, which is celebrating its 40th year in the auction business. Salt Lake City, Friday April 22, 2016. In the photo is a 1922 Studebaker and a 1960 Cadillac. Trent Nelson | The Salt Lake Tribune Auctioneer Rob Olson, right, and his sons David, left, and Robert pose for a photo at Erkelens & Olson, which is celebrating its 40th year in the auction business. Salt Lake City, Friday April 22, 2016. 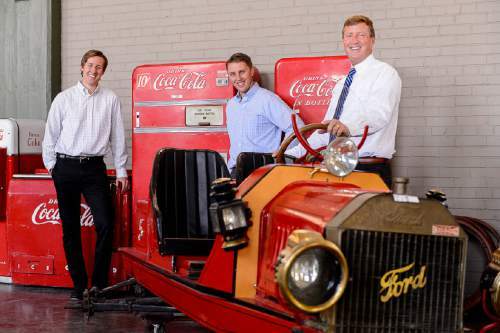 In the photo are vintage Coca-Cola machines and a 1913 Model T.
Rob Olson was on an LDS Church mission in 1976 when he got a call from his dad, Tom, saying he&apos;d just gotten into the auction business. It was a gamble for the elder Olson. Tom was 46, the father of six and a rookie in the business. He had been a general manager at Carlson Cadillac and owned a couple of used-car lots. Still, he told his son, "you&apos;ll love this business." "Boy, was he ever right," Rob Olson says 40 years later. Especially now, he adds, because his sons Robert and David have been involved for a dozen years, taking some load off their dad in the fast-paced world of auctioneering. They&apos;ll do so again at 10 a.m. Saturday when more than 200 high-end home furnishings and pieces of art are auctioned at Erkelens & Olson, 430 W. 300 North. Three weeks later, the Olsons will turn to selling industrial equipment and forklifts. On any given day, just about anything under the sun might be on the auction block. "It&apos;s really A to Z," Rob Olson says. "I&apos;ve auctioned Lear jets and apartments in Los Angeles. We sold 47 condos in Park City that brought in $18.5 million in two hours and a condo on the Vegas strip that went for $5.5 million just before the [2008 real estate] crash. I&apos;m not trying to brag, just to show the variety of things we&apos;ve been through." His biggest auction to date took place in 2010 when he sold the possessions of convicted fraudster Jeffrey Mowen, who had collected scores of muscle and classic cars and custom-made motorcycles. "When we advertised that sale, we got 40,000 hits overnight," he says. "Google gave us an award that fewer than 1 percent of businesses get because of that number." Olson learned a little about a lot of things while working for his dad at Olson Auction Galleries in Murray, often teaming with longtime employee Vic Rael to collect items in a 32-foot van. "We had our life&apos;s savings on that truck," Rob says. He also became an independent contractor for the U.S. Treasury, the lead auctioneer on government auctions across the country. "I would sell property in Hawaii and Puerto Rico, from Alaska to Florida," he says. "We auctioned 4,000 pairs of false teeth, which was kind of nutty. Another time we had six, 40-foot containers filled with brassieres of inferior material. Some guy bought it and shipped it to Sri Lanka." Working with the feds, Olson says, "educated me on different items in the market, trained me as an auctioneer." Like all auctioneers, he developed his own chant. "I&apos;m self taught, from listening to my father and others. I spend a lot of time with numbers and don&apos;t use a lot of filler words," he says. "It&apos;s what you put in between the numbers that sets your chant apart from the next auctioneer&apos;s."
Olson has learned his craft well enough to be an instructor, for both the Certified Appraisers Guild of America and the Missouri Auction School, an academy in St. Louis described as "the Harvard of auctioneering." One student was Ronnie Snorgrass, who has his own auction business in Clearfield and is Utah Auctioneers Association executive director. "Rob&apos;s been around the world and he knows the business," Snorgrass says, crediting Olson with emphasizing the need for auctioneers to be "slow, steady and rhythmatic … and enunciate the words so everyone can understand what&apos;s going on." Olson&apos;s not the fastest auctioneer locally, Snorgrass says, noting that honor belongs to Ogden&apos;s Doug Taylor. But fast or slow, he adds, a trait all good auctioneers share is being "persistent and honest. You have to be honest because you have to sell the seller and the buyer. You have to bend over to do what the customer needs." Sometimes that means settling for auctions that aren&apos;t blockbusters. Olson recalls the time he liquidated a bankrupt pet store and collected just $700. "We have to take the small ones, too," he says. "We can&apos;t be picky."